Guys, last night, I made something pretty fantastic. I did not take any pictures because I wasn’t sure it would turn out well (and then once we knew it turned out well, we were too busy scarfing it down to pause for artistry). I promise to update this with pics the next time I make the dish — which will probably be pretty soon since my husband loves Mushroom Risotto. 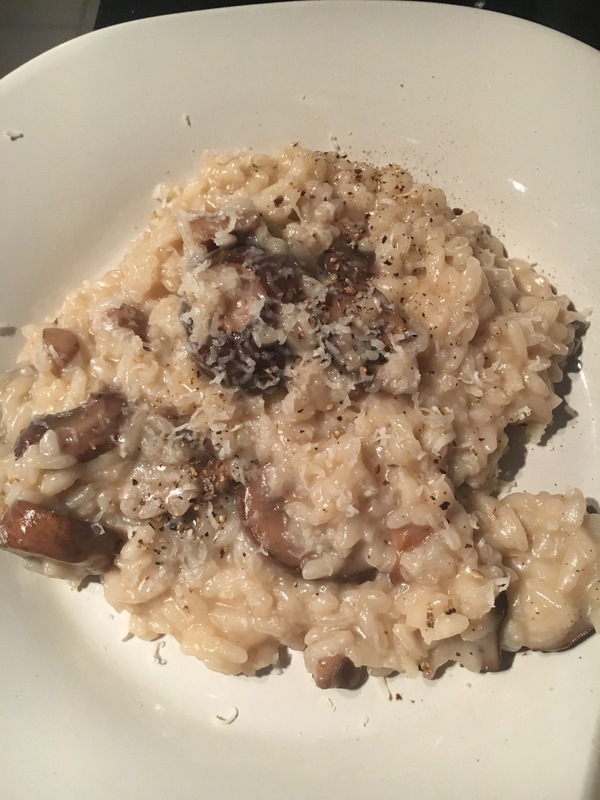 Usually when we make risotto, I saute the mushrooms in red wine and butter the way my mama taught me (with a nice large glass for myself, of course). Last night, we were out of Red. I had an opened bottle of White I usually use in soups and such, but it struck me that we have a full liquor cabinet that gets almost no cooking love from us at all. I made the off-handed suggestion of trying whiskey in place of wine, to which my husband enthusiastically agreed. He set about stirring that risotto like a champion, and I tasted my options and settled on Eagle Rare for this dish. There’s only the barest hint of grains on the tail end of the dish, enough to notice but not enough to overwhelm. The whiskey mixes deliciously with a pinch of thyme and the melted butter, and gets absorbed at the last minute by the fat risotto grains. Even if you don’t like drinking whiskey (I personally am not a fan), give this dish a try! Heat olive oil in sauce pan over Medium. Add the risotto and saute ~2 minutes, until they start to turn golden. Add 1 cup of broth, stirring constantly until all absorbed. Add another cup of broth. Continue until all broth has been absorbed. Meanwhile, melt butter in saute pan over slightly more than Medium (but not quite Medium-High). Add whiskey and mushrooms. Toss to coat. Saute 3-4 minutes, until mushrooms start to soften. Add thyme, salt and pepper. 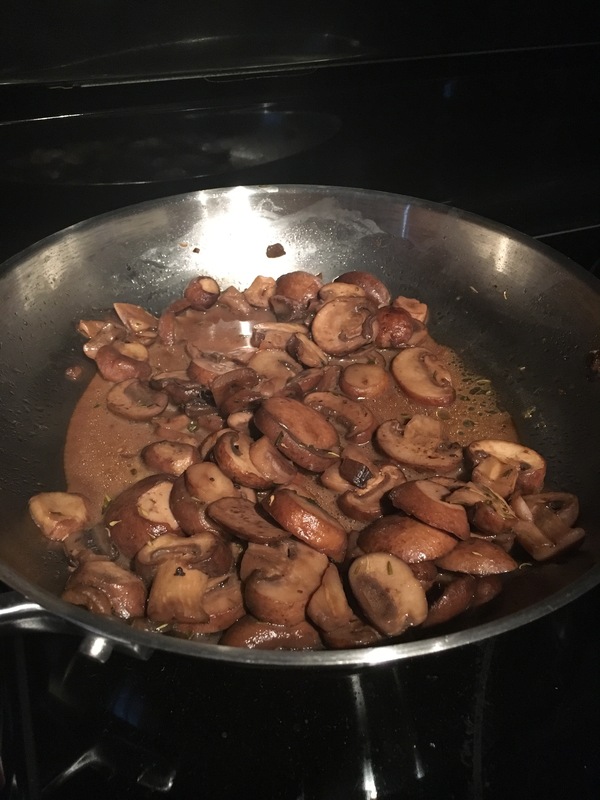 Continue sauteing until mushrooms are soft and brown, ~3-4 more minutes. Pour mushrooms and remaining sauce over the risotto. Stir until liquid mostly absorbed. Can garnish with a sprinkle of freshly-grated Parmesan cheese and sprig of fresh thyme. *NOTE: If you can get yourself a risotto-stirrer, it makes everything so much easier. 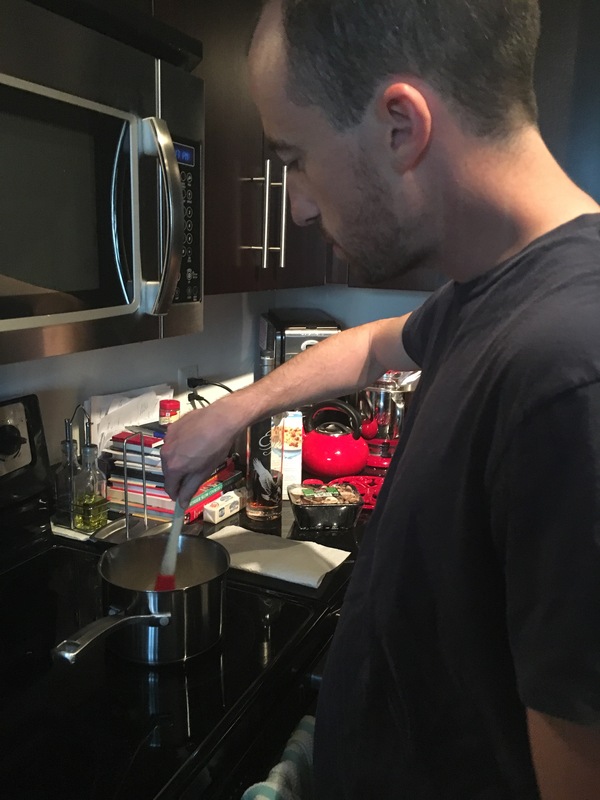 In the past, my husband and I have traded off turns stirring, but this time he did it the entire time like some sort of Herculean hero, and it was amazing. For me. He complained of a sore arm, but I was too busy enjoying our culinary masterpiece to pay attention.